Classmates.com is a social networking site you may have already come across from their extensive campaign of advertising. The site lets you get in touch with long lost friends, lovers and classmates. Looking for your long lost high school love? 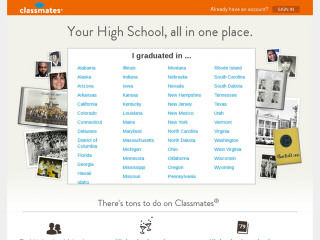 As the name suggests, Classmates.com lets you connect - or re-connect - with people from your old high school, college, or workplace. So if you're looking for your long lost teenage love, perhaps this a the place to try. You'll be amazed: your own little high school or college will be listed among the thousands of public and private high schools and in the US. To use the site, simply enter the city and state where you went to school, and a list of local high schools will appear. Pick your high school, and then submit a personal profile to sign up. The personal profile you submit will ask for the standard information, such as your name and e-mail. It will also ask for your graduation year. Once you've entered this information, you'll be able to browse all the listings of people who attended your school at the same time as you. You'll be surprised how many of your old classmates are already members. Members can post information about themselves in their personal profiles, including current photos (as well as old photos from their high school/college days), surveys, personal bios, and brief lists of their current interests. Classmates is a social networking and not a dating site. Not all people there are interested in romantic relationships. Many are just curios about their classmates. Rss Feeds. Subscribe to comments for this site. [?] Receive updates about Classmates.com directly through your newsreader.